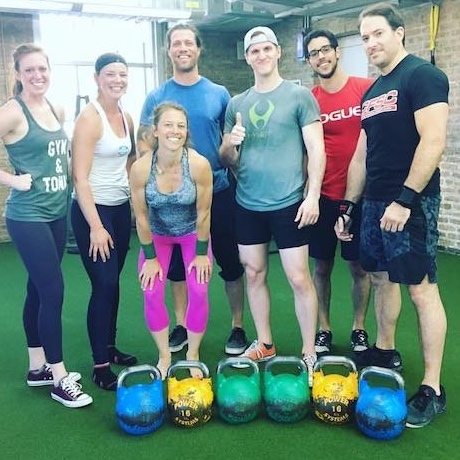 The KETTLE PRT is a community of athletes who enjoy getting stronger, learning new skills, and playing with kettlebells! Join us for a soul-shaking workout incorporating kettlebells, barbells, and bodyweight movements. We smartly balance the rigor of each lifting session with a recovery meditation at the end of class. Open to all experience levels. If you are new to the kettlebell, you will receive 1-on-1 coaching on all foundational skills. Katie is an RKC Team Leader, Certifying kettlebell instructor, and Iron Maiden. First time clients, email to reserve your space: Petersenkatie1@gmail.com. HiFi Fitness, 820 N. Orleans St.
What if I am new to fitness and/or have never used Kettlebells? Classes are open to all skill levels. If you are new to the kettlebell, you can expect 1-on-1 coaching toward foundational skills along with a killer workout. It’s important to have clearance from your doctor. If you do, the kettlebell can be an incredible rehab tool. As a movement specialist, Katie will guide you through the appropriate modifications for your body, which may vary from the class workout. What is the KETTLE PRT competition? The KETTLE PRT is a barbell and kettlebell lifting competition. It brings athletes together for a common fitness goal: a reason to train smart, with intention, and push yourself to new limits. This team event will challenge your maximal strength, level of conditioning, and ability to RISE TO THE OCCASION! Our classes are specifically designed to prepare you for this incredible event. More information can be found under COMPETITION or Contact Us. How will I know which weights to use? When you are being introduced to new movements, you will learn to pattern using very light weights and progress at your body’s level. You ultimately have jurisdiction over which weights you choose but will be guided every step of the way.